I finally got the chance to do my first official Field Test Shooting Video Review using the Caldwell Ballistic Precision Chronograph and like my Test video everything went really well. I was a little bit scared since my first round through it shooting the Crosman DPMS SBR CO2 Blowback BB M4 was a "no read" but then the following 5 shots where all good. I think my shot placement was just a tad off on the first shot as I adjusted my aim a bit for the tore 5 shots. So getting to the results of the Crosman DPMS SBR CO2 Blowback BB M4 Air Rifle... I was using a somewhat used set of 12 gram CO2 cartridges that I had previously shot a couple of magazine through shooting in a bit of semi auto and full auto so I would assume I had at least half of, if not a bit more of my CO2 left in them. The Crosman DPMS SBR CO2 Blowback BB M4 was also fully warmed up and it had been a day since I shot it last which lets the CO2 and the gun warm up and pretty much perform as if it was using new CO2 for the most part. My results shooting 5 readable rounds through my Caldwell Ballistic Precision Chronograph with the Crosman DPMS SBR CO2 Blowback BB M4 Air Rifle where an average fps of 402 fps, the slowest being 397 fps and the fasters hitting 411 fps so not too m much of a spread. I was using RWS 5.1 grain 4.5mm zinc coated Steel BB's for my testing. Moving on to my accuracy testing. I would like to note I was using a Red/Green dot scope which I think is a great add on for any action shooting air rifle. Shooting with the included open iron sights may not have given us a little bit different results but I don't think by too much. My first grouping was with 10 shots all in semi auto shooting mode and this resulted in a nice very close to 1 inch grouping with 8 out of the 10 shots all within about a 3/4 inch group. I then adjusted my sector switch to the much more fun full auto mode for the 15 remaining 4.5 mm Steel BB's and setup again 30 feet away. I then let her rip releasing all 15 rounds till the Crosman DPMS SBR CO2 Blowback BB M4 bolt locked back and to be honest I was fairly surprised at how tight my 15 round full auto group was. It only spread out to about 2 inches with not too much vertical drop so velocity remained pretty consistent which was nice to see. All in all you really can not go wrong with the Crosman DPMS SBR CO2 Blowback BB M4, it's got more than enough velocity at right around 400 fps which is great for a blowback action shooter still providing some nice accuracy not only in semi auto but also full auto shooting modes. And it has got to be the coolest looking and functioning 4.5mm Blowback BB M4 out there right now. 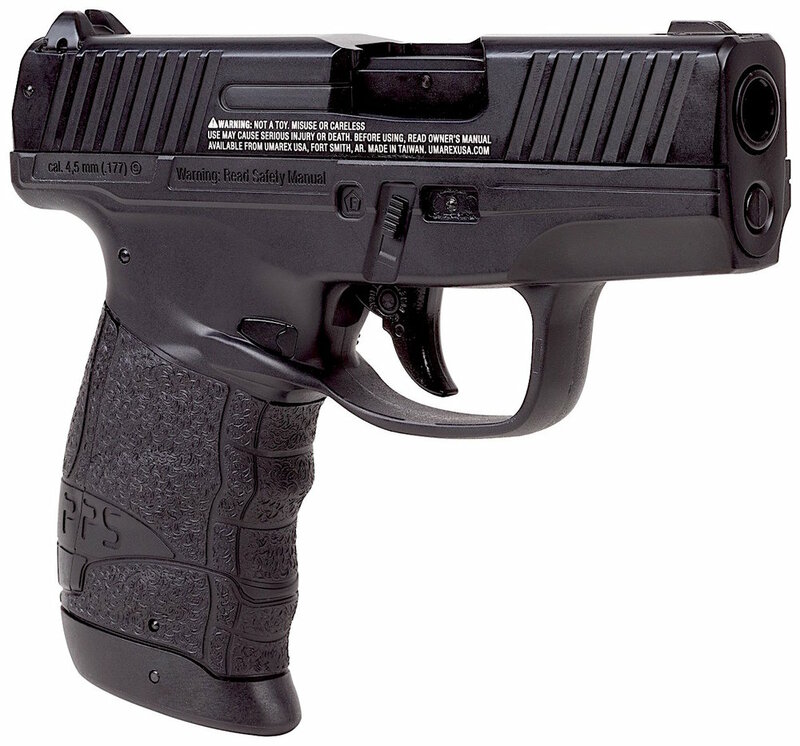 Type: Non-blowback CO2 BB Pistol. Weight: 1.6 pounds (725 grams). Action: Semi auto non-blowback, double action only trigger. Ammunition Capacity: 16 round drop out metal stick magazine. 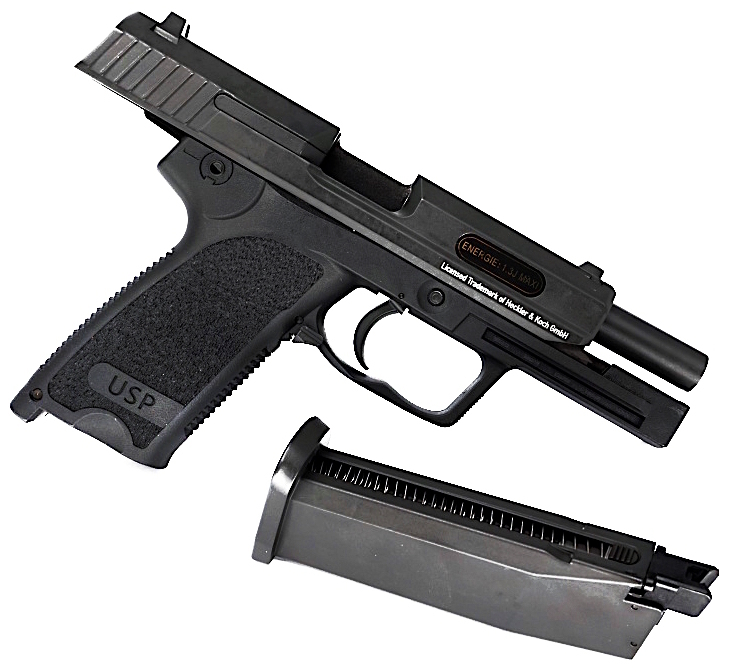 Trigger Pull: The trigger pull on the Umarex Glock 19 Non-blowback CO2 BB Pistol is double action only and has that inner barrel that protrudes out of the barrel external barrel thing that happens. You see this on many lower cost CO2 BB pistols. I believe the barrel is actually part of the action and kind of acts like the hammer hitting the valve after it has allowed a BB to enter the break area. The double action trigger is a bit long but not overly heavy and does have a working trigger safety on it. Accuracy: At this point I have not shot the Umarex Glock 19 Non-blowback CO2 BB Pistol so I can only quote what Umarex is saying in terms of FP2 which is 410. That's sounds reasonable and based on other similar guns like this the Umarex Glock 19 Non-blowback CO2 BB Pistol should get lots of shots out of a CO2 and produce decent shot groupings on target. We will find out when I get another Chronograph for my Field Test Shooting Videos. Build Quality: The Umarex Glock 19 Non-blowback CO2 BB Pistol is really well made. It's super solid at 1.6 pounds and feels in the hand like a real Glock would. Fit and finish are very good and you are going to find lots of metal parts where they would be and need to be on this air pistol. Realism: The Umarex Glock 19 Non-blowback CO2 BB Pistol absolutely looks the part, sitting on the table and even holding it in your hand you are going to think it's the real deal. When you start trying to cycle the slide and eject the magazine is when you are going to quickly realize this is not a 9mm Glock 19 but rather a replica 4.5mm Steel BB version. I am hoping that down the road Umarex and Glock will come out with a full blowback and full metal drop out magazine version? Great weight and feel to it, build quality seems really good. Really nice looking replica of the original Glock 19. So far the only Glock official licensed 4.5mm Steel BB pistol. Not bad feeling double action only trigger, perhaps a bit long. 410 fps is nice and strong. Fixed slide with no blowback action. I know this version of the Umarex Glock 19 Non-blowback CO2 BB Pistol is not exactly what we where all hoping for... That said we are making progress. Glock actually licensed there name out to an Airgun manufacturer and is working with them to come out with even better future versions and models so be happy with what we do have and pick one of these first generation Umarex Glock 19 Non-blowback CO2 BB Pistols, after all this is history in the making and I know I want to own the first ever officially licensed Glock BB Pistol, don't you for under $100? If you're interested in picking up an Umarex Glock 19 Non-blowback CO2 BB Pistol for yourself you can find them in our Replica Airguns Canada and US Online Store. Weight: 6.5 pounds (4.98 kilograms). Length: 26.9 - 30.4 inches. Propulsion: 12 gram CO2 dual cartridges. Trigger Pull: The trigger pull on the Crosman DPMS SBR CO2 Blowback BB M4 Rifle is sin gel action only since the charging handle must be cocked first before you can shoot it. The trigger is short and fairly light but not too light that a misfire can happen easily. Then Crosman DPMS SBR CO2 Blowback BB M4 Rifle makes for a great action shooter in semi auto or full auto mode! Accuracy: So far I have only played around with the Crosman DPMS SBR CO2 Blowback BB M4 Rifle but I can say it feels pretty good and seems to hit what I aim at even when in full auto mode which does rock the gun a bit. Don;t expect full auto mode to be the most accurate but it sure is fun and with all those BB's coming out the barrel at 1400 rounds per minute you're probably going to hit what ever your shooting at. Because of the blowback operation you will get a little over 400 fps which is totally fine for an action shooter like this. Build Quality: The Crosman DPMS SBR CO2 Blowback BB M4 Rifle is well made all around. Weighing in at 6.5 pounds it feel solid and well built. There is a lot of metal going on inside and out of this rifle but keep in mind the top and bottom receiver are plastic but metal parts are where they need to be like in the internals, pretty much all the working parts are metal, the magazine is full metal, the buffer tub is metal and of course the barrel is metal. Realism: The Crosman DPMS SBR CO2 Blowback BB M4 Rifle is about as real as you are going to get in a CO2 Blowback M4 styled Airgun. You can even take it apart into the top and bottom receivers like the real steal version. The blowback action gives you some recoil but more importantly offers a true single action trigger and of course the full auto ability we all love. Almost all the working parts work like they would on a real M4 other than the forward assist which is moulded into the receiver. Most realistic working M4/AR 4.5mm BB Rifle out there right now. Full blowback operation with both semi and full auto shooting, can feel the blowback operation rocking the gun. Great weight and feel to it. Duel CO2 full metal drop out magazine that holds 4.5mm steel BB’s as well. Lots of rails of mounting additional cool hardware. Muzzle cap looks cool too! Receiver is plastic but well made and does not compromise feel or weight since there is lots of metal throughout this gun. Rear Buttstock is not compatible with the AR platform. If you haven't figured it out already I love the Crosman DPMS SBR CO2 Blowback BB M4 Rifle and I know anyone that picks one up will love theirs too! I just wish we had them in our Replica Airguns Store but for now we are not Crosman distributes :( We do have some other nice M4/AR styled BB rifles like the HellBoy which I may put head to head against the Crosman DPMS SBR CO2 Blowback BB M4 Rifle at some point even though they are very different in how they operate and their pros and cons. 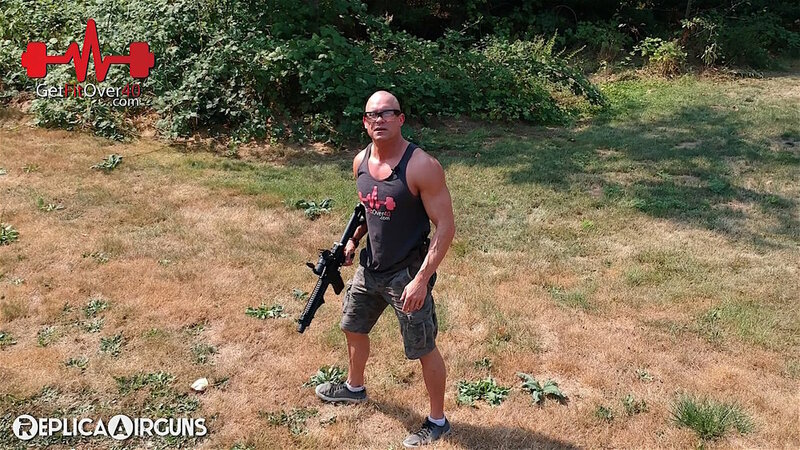 I had a lot of outdoor fun just playing around with the Air Venturi HellBoy M4 CO2 BB Rifle but a real Field Test Shooting review had to be done, maybe not as fun as my outdoor video but I still had a great time shooting the Air Venturi HellBoy M4 CO2 BB Rifle none the less. So how did the Air Venturi HellBoy M4 CO2 BB Rifle do? Unfortunately my Chrony Chronograph bit the dust, even though it I just bought it well I guess we are going back 2 years ago but still my luck with the Chrony Chronographs has not been good :( I thought it was perhaps the battery but when I switched it out for a new one I still got the same gibberish on screen! So I resorted to using my Airsoft Chronograph which is not ideal for testing our steel BB's and or Lead Pellets. I did get some results which gave me a three shot average of 437 feet per second, this was after shooting off a full magazine and I was having some slight CO2 leakage with my Air Venturi HellBoy M4 CO2 BB Rifle? Perhaps a bad valve or seal? When I was playing around with m y Air Venturi HellBoy M4 CO2 BB Rifle outside shooting clay pigeons at a variety of distances I found it to be pretty accurate finding my targets most of the time even out to 50 feet or more. So was not too surprised when I shot a nice 1 inch 10 round grouping using a mounted red dot scope to help a little bit. All in all the Air Venturi HellBoy M4 CO2 BB Rifle is a pretty slick Replica Rifle to own, I will be comparing it to the Crosman DPMS SBR now that one has arrived, they both have pros and cons so it will be interesting to see which one is going to be my favorite at the end of the day but I can say if you can own both then go for it! And don't forget to watch my Table Top Review for the Air Venturi HellBoy M4 CO2 BB Rifle where I go into some more detail and show you around up close. Weight: 5.2 pounds (2.4 kilograms). Barrel: 14.5 inches, smooth bore. Propulsion: 12 gram CO2 single cartridge. Action: Non-Blowback - double action only. Trigger Pull: The trigger pull on the Air Venturi HellBoy M4 CO2 BB Rifle is a double action only trigger since there is no blowback action to set the trigger in single action mode. So it will be a bit heavier than a true single action trigger. That said the trigger is not bad at all and can be activated very quickly for tons of fast action shooting or at least until your 18 rounds are all gone :) I would say the trigger pull is between light and medium with a medium pull length and not that much take-up at the beginning. Accuracy: So far I have only played around with the Air Venturi HellBoy M4 CO2 BB Rifle shooting at clay pigeons from various distances and it was surprisingly accurate for me off hand shooting like this. I could easily hit a clay pigeon from about 50 feet away with most shots. Watch my "Having Fun with the Air Venturi HellBoy M4 CO2 BB Rifle" video if you want to see how it did. In terms of velocity, I have seen other reviews that show it getting pretty close the 495 fps claimed so until I do my actual Field Test Shooting Video we will have to go on this info. Build Quality: The Air Venturi HellBoy M4 CO2 BB Rifle is made in China, some people will not like that but I found it to be very well built in general, fit and finish are as good if not better than any Taiwanese airgun I have reviewed so quality control in the factory must be good. You are going to find metal parts where you would expect them to be on a real M4 (AR) like the receiver, barrel, buffer tube, magazine, carry handle, forward assist, charging handle, sling mounts, safety and magazine release. Plastic parts are going to be the rear stock, hand guard, and pistol grip. Realism: The Air Venturi HellBoy M4 CO2 BB Rifle is a 1 to 1 replica of the M4 or AR platform and even has some interchangeable parts with real AR or M4 like the hand guard and rear stock. You can even take this gun down into the two halves, upper and lower which makes for barrel cleaning or BB jam removal pretty easy. Even though there is no blowback action or internal bolt, you can pull the charging handle back which opens the dust cover just like the real deal. Other working moving parts are the magazine release, selector switch, forward assist and adjustable rear stock. Great to have another full size Rifle available to purchase in a BB gun version. Can be field stripped, carry handle is removable. Can swap out hand guard and rear stock with real steel AR parts. Full size drop out metal magazine that holds the BBs and CO2. Great looking replica of the real steel M4 AR, operation and weight. Variety of sling mount hook in points for varies styles of slings. Fully adjustable rear sight with duel apertures. Working, dust cover, forward assist, magazine release, selector switch. Price point is reasonable for this type of full size mostly metal BB rifle. Semi auto and double action only trigger only. Magazine only holds 18 rounds and a single CO2. 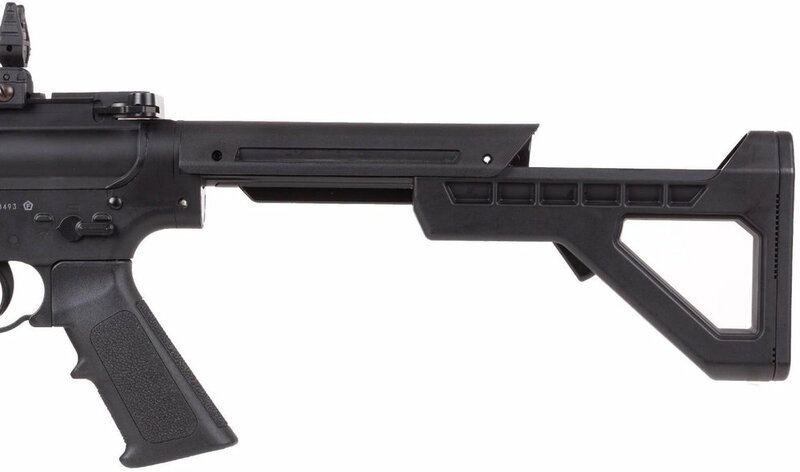 I think the Air Venturi HellBoy M4 CO2 BB Rifle is a super addition to the replica rifle lineup. I know we all wish it had blowback operation and shot in full auto mode too but there are trade-offs here and you can still have boat loads of fun shooting the Air Venturi HellBoy M4 CO2 BB Rifle even in semi auto only mode. The fact that it does not have blowback allows for some generous fps velocity and more shots per CO2. It looks really great, feels really great and shoots really great all in a mostly metal build which is what everyone has been asking for and at a reasonable price. I think the Air Venturi HellBoy M4 CO2 BB Rifle is a total winner and recommend it 100%. You will not be disappointed!